I haven’t received my copy of The Rafu for the past few days, so I called Editor Gwen and asked her if my name was taken off the list. I told her that I’ve been going to one of the shops in Gardena that sell The Rafu. I laughed, paid for the paper and walked out of the store. No, I didn’t tell her I was the writer of the “Horse’s Mouth.” That might have confused her. Did I mention that I’m heading to Las Vegas next week? It will break a streak of six months since my last visit. Needless to say, that’s a new record for me. At least I hope the person who agreed to drive us won’t back out. If he does, I’m probably going to go another few months of absence. Well, the readers will know because as I always do, I’ll file a least one column from The Cal, where I always stay. I contacted The Cal but haven’t heard back from them yet. Maybe they forgot who I am since I haven’t been absent this long from their facility. Yeah, I missed my frequent trips. One reason I am making the effort to get to Vegas is that my sister from Northern California will be visiting and it’s a lot easier for me to get together with her in Vegas than going all the way to her home near San Jose. Yeah and she’s a bigger Vegas fan than I am. I would say she makes it to Vegas at least six times a year, and since she and her daughter fly there, they spend less time traveling than I do when I go in a car. It takes her a little over an hour from San Jose International Airport to Vegas. Needless to say, she’s a bigger casino player than I. She always laughs when she sees me playing the quarter slot machines. “You come all the way to Vegas just to play the quarter slots?” she always kids me. Yes, I live in a great neighborhood in Gardena. An example? Since I started hobbling around with a cane since my aging legs don’t function like they used to, my neighbors, without my even asking, will mow the front lawn of my house. Hey, even one of the city councilmen, a Nisei, came over once to cut our lawn. Where else can someone make a statement like that? And if it’s not my lawn, they will always ask me if I need something else done around my property. One thing about writing a column — just when my mind is blank and I don’t have any issues to touch on, I get hit with a few things that get me rolling. Yesterday, I received a campaign flyer from James Hellmold, one of a handful of candidates seeking the office for L.A. County sheriff in next month’s election. Since I am backing Paul Tanaka for the position, I wondered when the mayor of Gardena would launch his campaign. The very next day, today, I received a campaign flyer from Paul’s committee. It was impressive since it was backed by the Gardena Police Department and the Gardena Police Officers Association. It will be a tough election for Tanaka, but I would rate him as one of the favorites to take over the position vacated by Lee Baca. I support him not just because he’s a fellow Japanese American, but because Tanaka has proven his capabilities both as undersheriff and as the mayor of Gardena. I don’t think that his Japanese American ancestry will play that big a role in his campaign. Of course, I’m sure as the campaign heats up, his ethnic background will become an issue with those opposing him. Whether this will be a plus or minus, we can’t say; however, I am going to jump on his bandwagon when he begins his active campaign. Wouldn’t that be something? 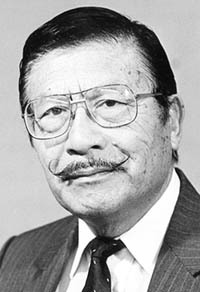 A Japanese American heading the largest sheriff’s department in the U.S. Since Tanaka and Hellmold have launched their campaigns, I’m sure I’ll be getting more and more flyers from the others seeking the sheriff’s position. It won’t be an easy race for any of the candidates. The other morning I stepped on the scale in our bathroom and was kind of amazed to see the needle stop at 168 pounds. It’s the lightest I’ve been in I can’t remember how long. Would you believe that in 1948, about three years after I was discharged from the Army, I hit 230 pounds. You read that right, two hundred thirty pounds. Hog Yoshinaga? No way. So I began dieting, which means I cut out eating one small-size pizza every day and turned to salads and vegetables. Yeah, I cut back on eating rice, too. Of course, weight didn’t matter after I suffered a broken ankle in a game that ended my football career. Yeah, when I played high school football, I was about 170 pounds. So, now, as a newspaper columnist, I’m almost 10 pounds lighter than at any time during my football career. There was a time when Hawaiian culture had an influence on the Japanese, but the article says the reverse. The Japanese, due to their large numbers visiting the Islands, have influenced Hawaii. I guess that would start with food. “Nihon-shoku” has become a part of Hawaii. Since there are so many Japanese American residents in Hawaii, the use of the Japanese language is almost as much a part of the words spoken there as pidgin English. Well, maybe it’s not that bad. One thing for sure. You’ll see just as many Toyotas and Hondas as you’ll see Fords and Chevys. So, it might be “konnichi wa” instead of “aloha” in greeting people. Regular readers of my column will probably be thinking, “Man, Horse must be wandering off somewhere,” because of the subject matter I’ve been putting down today. As I frequently say, when one has to fill two pages a week in The Rafu, it sometimes becomes a chore thinking about subject matter. Yeah, if I were making my usual frequent trips to Vegas, I could fill at least a page with chatter about my favorite town, but I can’t find the same kind of stuff for Gardena. Heck, nowadays I can’t even touch on politics in our town because fewer and fewer JAs are involved in the city, although we still have a large JA population. Yes, we still have Paul Tanaka as mayor, but there was a time when not only the mayor’s seat was occupied by a JA, but so were the City Council positions. Yes, I can still find a lot of Japanese eating places to dine at. I can’t believe I’ll be a resident of Gardena for 60 years later this year. Of course, my neighborhood isn’t made up of a majority of Japanese Americans. At one time, every other home was occupied by JAs. Today, on our block, there are only four JA families, including a broken-down newspaper columnist. There are friends and there are Hawaiian friends. Friends never ask for food. Hawaiian friends always bring the food. Friends have never seen you cry. Hawaiian friends cry with you. Friends will eat at your dinner table and leave. Hawaiian friends will spend hours talking, laughing and just being together, then help clean up when all pau. Friends will leave you behind if that’s what the crowd is doing. Hawaiian friends will kick the whole crowd’s okoles that left you. Friends get mad when you don’t stay in contact. Hawaiian friends, years could go by and you pick up like it was yesterday. Friends come and go. Hawaiian friends are family.